Mallorca is a beautiful destination no matter the season – and when you cruise into the harbour on your luxury yacht, you will see why. Spring turns the island into a fragrant oasis, with wild rosemary blooming and almond blossoms carpeting the meadows. Summer is also a perfect time to schedule a luxury yachting vacation, as the island throbs with visitors (including celebrities, royalty and jetsetters), nightlife is at its peak and the sunny weather begs to be played in. Whether you’re a newcomer or an expert, Mallorca is also a golfer’s dream, with a variety of courses in diverse settings. Son Gual – which made it into the European Top 100 – is a work of art: elaborately designed around a collection of lakes, olive trees and wild flowers. Poniente is one of Mallorca’s oldest courses, while Son Muntaner Golf – with its easier course – is best suited for beginners. With its long warm days, summer is also ideal for marine adventures. Try kite-surfing or water-skiing, or head underwater with a dive group and explore Mallorca’s abundant aquatic life. You might spot octopi and colourful fish, or swim around a shipwreck. Safe, educational shark dives are offered at the Palma Aquarium. Autumn on the island is warm and the foliage in the vineyards and on the trees gleams gold and copper. Mallorca is also quieter at this time of year. The beaches are not crowded and the streets not as busy, so you can relax into the tranquillity and take in the views from the deck of your yacht. 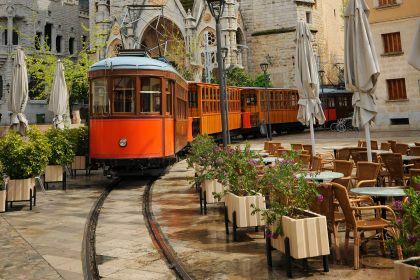 There are many things in Mallorca that are fabulous all year round. 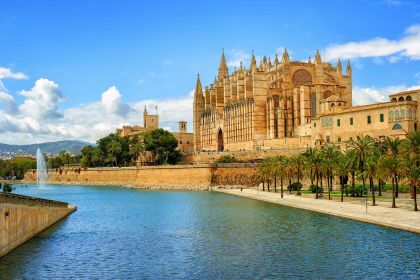 Palma de Mallorca, the capital of the Balearic Islands, is an enticing mix of past and present. The 14th-century hilltop castle, Castell de Bellver, houses the City History Museum and has spectacular views of the Bay of Palma. Take a stroll along the palm tree-lined Paseo Maritimo promenade, where the Mediterranean Sea laps on one side and windmills housing discos throb on the other. Stop in at the Catedral de Mallorca, one of the few cathedrals built on the seashore. Mallorca’s interior also has a host of secrets to share with you: olive and almond gardens; the Arta caves, their magnificent stalagmites illuminated by a music and light show; the creamiest ice cream at Cala D’ice; and succulent catch-of-the-day fish at Restaurante Toque. A diverse range of shops and boutiques line the island’s shopping streets, Jaime III, Sant Miguel and Sindicato. You could spend hours hunting down clothes, accessories, jewellery and designer fragrances, with local items on offer as well as Spanish and other international brands. 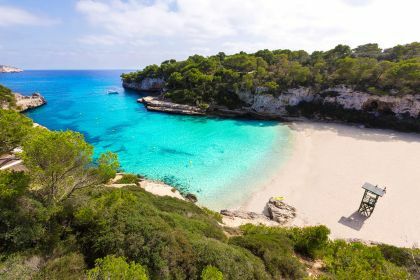 When you are on a yachting holiday in Mallorca, a visit to Menorca – just 20 miles away – is well worth it. Also part of the Balaeric Islands, Menorca is smaller than and very different from bustling Mallorca. In 1993, Unesco declared the island a biosphere reserve, and as a result there are no high-rise buildings and the holiday atmosphere is low-key and environmentally conscious. Formentera, the smallest of the Balearic Islands, is also a good day-trip option, especially if you are looking for peace, pristine white beaches and excellent windsurfing conditions. Include Mallorca, Menorca, Ibiza and Formentera in your yachting itinerary to get the best out of your next sailing or power-boat vacation on the Spanish Riviera. Should you need further assistance to plan your perfect yachting vacation on the Balearic Islands or Spanish coast, call our friendly brokers. You can also contact us online here.